1. Her family emigrated from Jamaica to America when she was 11-years-old. Yoon used her experience of being caught between two cultures to flesh out the lives of the characters in her second novel, The Sun is Also a Star. Natasha and Daniel are both children of immigrants. Natasha’s family is facing deportation back to Jamaica when she meets Korean-American, Daniel. 2. Yoon studied engineering at Cornell then spent two decades working wall-street hours for investment management firms before getting her first book deal. 3. The birth of her daughter inspired her first novel, Everything, Everything. Yoon says a protective instinct kicked in after she gave birth that made her worry constantly about her daughter’s safety. This led her to imagine a mother desperate to protect her child, and what that mother would do if her child was born allergic to the entire world. 4. The Sun is also a Star, Yoon’s second novel, also came out of personal experience. Jamaican-American, Natasha, loves maths. Her love-interest, Daniel, is a Korean-American who writes poetry. The characters share their interests and ethnic backgrounds with Yoon and her husband. The conversations they have as they zip across New York on public transit, about God, fate, science vs art, love, time, and so on, are the kind of topics Yoon and her hubby also love to grapple with. 5. She wrote Everything Everything over three years while working a full-time job. She would write from 4am – 6am every morning before work. 6. When she was growing up, Yoon did not see herself represented in the books she read. She wants to change this for her daughter. 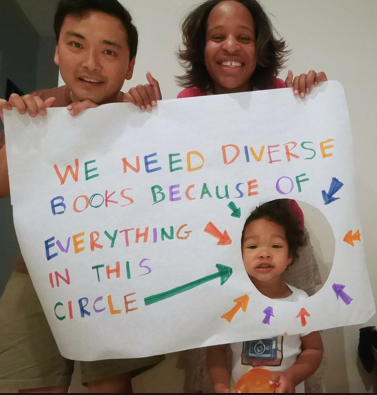 She is a vocal supporter of the We Need Diverse Books campaign. She argues that it’s important that we all get to see ourselves as the hero of a story. “Stories help shape the way we see ourselves in the world. They help tell us who we can be and what we can achieve. 7. Her husband is a graphic designer and illustrates her novels. 8. She is careful when writing about other cultures. After creating Daniel, a Korean–American whose father owns a black beauty supply store, Yoon tapped not only her Korean–American husband to read the manuscript, but also her sister-in-law and her circle of beta readers. She wanted to ensure she got the facts right and that she didn’t accidentally create any harmful or stereotypical representations. 10. She wants to see the portrayal of black girls in popular culture expand. Natasha, star of The Sun is Not a Star, is a science nerd with a passion for 90s rock bands. 11. The big screen version of Everything, Everything will be in cinemas from May 19. It stars Amandla Stenberg and Anika Noni Rose and is directed by Black-Canadian film director, Stella Meghie. Yes, it’s fascinating how her personal life experiences are informing her work. Can’t wait to see what she writes next. Great list! Correction though: Her second book is called “The Sun is Also a Star” not “The Sun is Not a Star” like in #1. It’s a beautiful story and instantly became a favorite of mine.